We have a special guest today, country western singer Kaci Bays. We have been playing music by Kaci at the end of our recent episodes and the fans have loved it, so we decided to have a special episode where we interview Kaci. Kaci was a backup singer for Mickey Gilley before branching out on her own. Now she performs around the Tucson area. 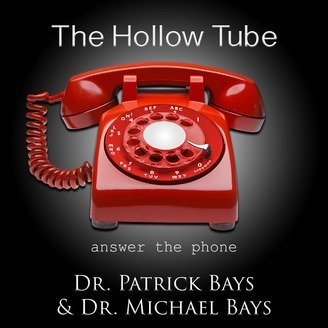 She is also married to Hollow Tube host Dr. Michael Bays. This is a great episode. 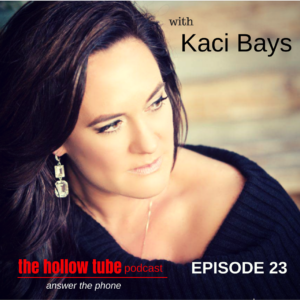 Kaci adds fun, humor, and music to the show. She shares how her and Michael first met with some funny stories about Michael playing it extremely cool on their first date. She also shares how she started performing, and how she ended up auditioning for and working with Mickey Gilley. We talk about synchronicities and how pathology in any relationship will show up in six months. Along with more fun and entertaining insights from Kaci. [03:49] Kaci thinks The Hollow Tube is great and keeps getting better and better. [04:09] 21 is the family’s lucky number, but it is not their mom’s birthday or Michael’s address. [05:25] How Branson is the number one tourist destination in America. Everything that happened to Patrick in Branson revolved around the number 21. [07:43] Kaci ended up in Branson when her ex-husband got a job singing there in 1992. [08:32] Kaci’s whole family sings and her dad did The Hollow Tube podcast intro. Her parents owned a talent agency. Kaci did commercials and her first paying gig was the sound of music at a dinner theatre in Astoria. She played Marta. [10:58] Kaci also sings with her sisters that do the backup on some of her music. She got into professional singing when she moved to Branson. [12:31] She did a cassette in a recording booth for a contest. She didn’t win the contest, but it ended up getting her a first job singing in a show. [13:30] Then she got a job at a theater in Springfield called The Sounds of Branson. After this show, she got the backup job for Mickey Gilley. [14:50] She worked with Mickey Gilley for 16 years. Her audition was being filmed during a live performance. Fortunately, she became friends with another woman there who taught her all of the backup moves, so she aced the audition. [19:20] Mickey Gilley had an illness and a shunt was put in, but then he had a fall and was paralyzed for a while. He is doing great now at the age of 81. We listen to Mickey Gilley Candyman. [24:01] Kaci went to high school in AZ, but her and Michael met in Branson. It was synchronicity and destiny. [25:02] Kaci’s friend’s husband was installing surround sound at Michael’s house and he set up a blind date for Kaci and Michael. [26:45] They went on a blind date. Michael really impressed her with all of his dogs, and his fridge with only two beers, and immediately forgetting her name. Then he wanted to take separate cars in case he gets paged. Kaci didn’t fall for his games. [28:20] They went to a bar and Michael sat with his back to Kaci. Then he points out a woman at the bar who was wearing a dated acid washed jacket, and then he says he bought her that outfit. In spite of everything, they hit it off. [31:01] Dating Michael was kind of like the new Beauty and the Beast movie. But Kaci new there was a softer side under the shell. [32:39] Michael called her the next day, but then they didn’t speak for a month. Then Michael went to her show, and then they started dating. [34:30] The Bays brothers in Branson were referred to Boogers and Bones. Then Michael would give Kaci a wadded up ball of money to get shots. [36:08] It took up until last week for Kaci to get in the groove of being with Michael. Just kidding, it was about a year after beginning to date Michael they looked at rings together and then Michael bought the ring Kaci picked out. [37:46] Then they got engaged on an alumni cruise in January 21st. Another awesome song by Kaci that she recorded for their wedding. [43:33] They got married and had Parker. [48:06] Kaci and Michael had their ups and downs, they were even separated for a time. Michael made a life change and had a spiritual change that he chose to do on his own. [52:55] After coming back from Brazil Michael now has compassion, love, and caring. He is still growing and evolving. [54:41] Michael’s best qualities are the advice he gives people and what he has learned in all of these journeys that he has been on. He is always trying to help people. He is amazing. 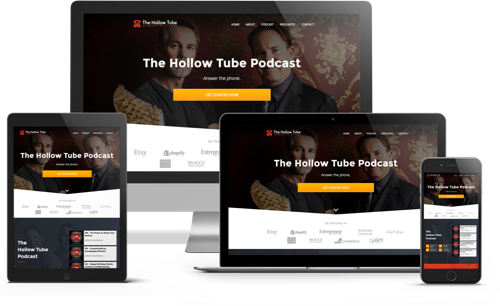 [56:17] They are doing the podcast for themselves, but it is in the hope of benefiting other people. [56:49] Patrick has impacted Michael by setting an example for Michael becoming a very well respected physician. [58:31] Patrick can sing like Johnny Cash and/or Elvis. He sang in front of a group for the first time. [59:13] How the best days of your life just keep getting better. [01:01:40] Kaci wants her granddaughter to remember how important family is and to never let go of family. [01:03:57] Kaci wants her type ones around her. The people who love her unconditionally. [01:05:10] Kaci gives a shout out to her friend Carla.